I was feeling sort of blue this week. Maybe it was the end of my food-and-family-filled Midwest extravaganza, or the fact that it snowed all over Boston. Again. Or maybe it was because of the 4-inch long rip that appeared down the back pocket seam of my dark skinny jeans on Friday – while I was still in them. At work. That definitely could have been it. Then again, maybe I was feeling blue because I subconsciously wanted to match my emotional state to the color of my lips and fingertips – after the heat in my apartment decided to stop working. At any rate, one thing was clear when Friday afternoon finally rolled around: I needed bacon, Ryan Adams, and lemon cake. First, the bacon. Kath and I went to the BusyBee for breakfast on Saturday, and after squeezing into the small, crowded box lined with teal-blue booths, I was already starting to feel better. At least, I was starting to regain some feeling in my fingertips. The way I think of it, the BusyBee is to restaurants what Merrells are to shoes: sturdy, no-nonsense, and full of older people. And they do a great breakfast. 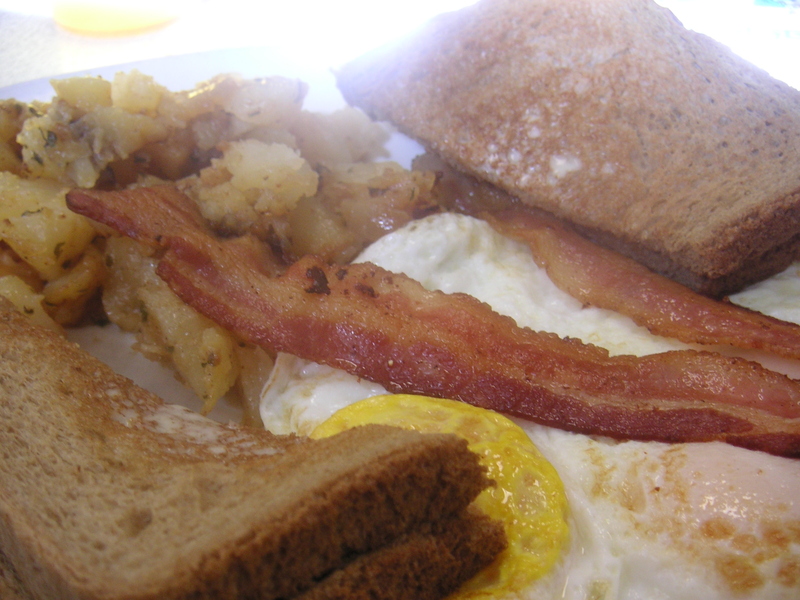 We each had two eggs over-easy, with bacon, homefries and wheat toast. Nothing fancy, just good, old-fashioned breakfast. Yum. Saturday night brought the second ingredient in my anti-blues cocktail: Ryan Adams. Mr. Adams and his band were set to play at the Orpheum Theater in Boston and, after much hand-wringing and Craigslisting, Katherine managed to get tickets. Our friends Lexi and Josh came down from New Hampshire and we all ate macaroni and cheese and drank beer before heading over to the concert, where we drank more beer and swayed to the folksy rock beats of Ryan Adams and the Cardinals. It was fabulous. They played a bunch of songs I recognized, and many which I did not. For me, the highlights were Two, Oh My Sweet Carolina, a cover of Wonderwall, and my favorite, Come Pick Me Up. Everytime I heard the “I wish you would…” part of the song, I felt slightly squeezy in my chest. I think because I love those lyrics. So sad and vivid and sort of funny. And they come with harmonica riffs. Chest squeezy ones. …Whatever, just listen to the song. 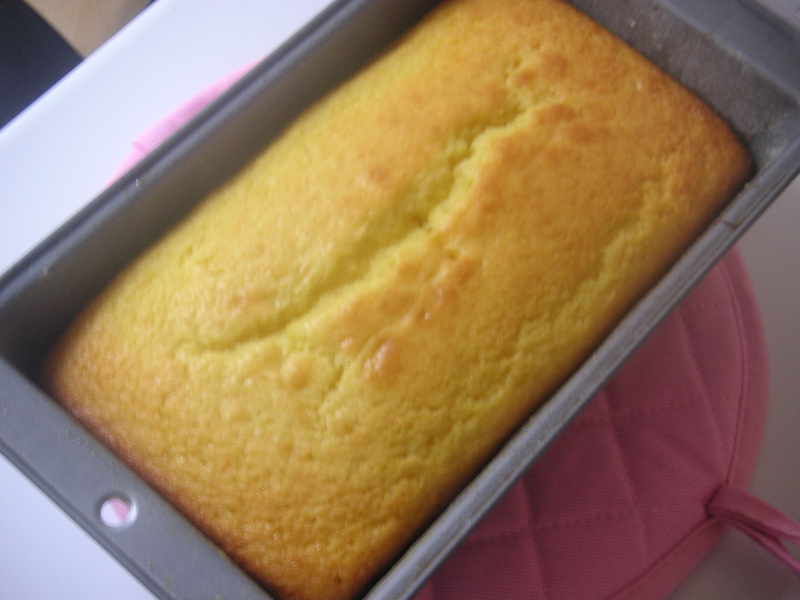 Today is Sunday, and it’s rainy, so I decided to make lemon yogurt cake. Not that I mind rain on Sundays – Sunday rain happens to be the coziest kind of rain. I just thought that lemon yogurt cake would be the perfect way to frost the cheerful cookie of a weekend I’ve been having. I was right. This cake is wonderfully light and delicious, with an airy, moist crumb and a subtly bright, fresh lemon flavor. It made the whole apartment smell eggy and lemony, like summer. Almost made me forget it’s February. …Almost. Anyway, this cake definitely lends itself to rainy Sundays – make it while you wait for your laundry to dry and listen to Easy Tiger, and then eat it while you watch the Oscars Red Carpet, and be thankful that you get to eat lemon yogurt cake while Kate Beckinsale (who I bet has never eaten lemon yogurt cake) has to waltz her tiny self down a long carpet in a corset and 5-inch heels only to sit through a 5-hour ceremony to not get an award. Yeah… I choose cake. When the cake is done, allow it to cool in the pan for 10 minutes. Carefully invert the cake onto a baking rack over a sheet pan or platter. While the cake is still warm, poke a few holes in the top of the cake with a fork, then pour the lemon-sugar mixture over the cake and allow it to soak in. Cool. Sift confectioner’s sugar over the cake, to decorate. Enjoy with homemade blueberry sauce or a cup of hot tea. This is the best blog ever! I mean, ever! Oh, and is there any lemon cake left?